About: The Hills Hotel has recently been renovated and refurbished. They look really great for a 3-star hotel. They are offering several room types; Superior, Deluxe, Executive and Suite rooms. Pros: Superior (20 sqm) & Deluxe (33 sqm) rooms are decently sized. Rooms come with full-height glass windows overlooking Nagoya Hill Shopping Mall. The hotel also has a brand new café. Here you can enjoy locally-brewed coffee and pastries! Kokuo Reflexology and Oriji Spa; 2 new spa & massage centres are on the hotel’s 1st floor. Cons: Aside from the 4 hotel rooms which we covered earlier, there is also the Standard Room type which is quite dated. The corridor of the rooms also feels a little cramped. In terms of interior accessibility, the hotel has only 1 elevator & a flight of stairs. 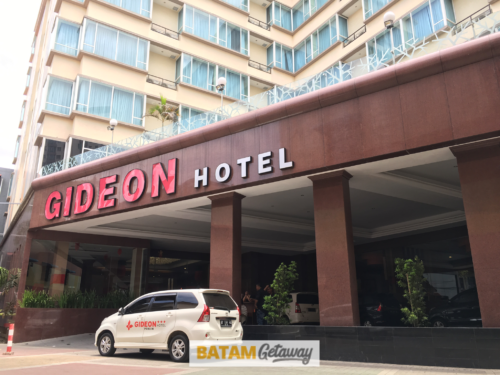 About: Gideon Hotel Batam is a 3-star hotel with 163 rooms and is one of the better hotels located in Baloi/Penuin. There are several room types which you can consider booking; Superior, Deluxe, Junior Suite & Executive Suite. Pros: Rooms are fitted with a safe-deposit box, flat-screen TV, minibar and electric kettle. All rooms are slightly bigger than other 3 stars hotel in Batam – definitely value for money! Bathrooms come with a standing shower and complimentary toiletries. They do have meeting rooms and ballrooms which can cater to business’s needs. Right at their doorstep, they have the well-known Martha Tilaar Spa Express offering spa & massage treatments. Cons: In some rooms, some guests experienced a prolonged waiting time for the air conditioning to cool the room. Some also noted the limited breakfast options in the morning. 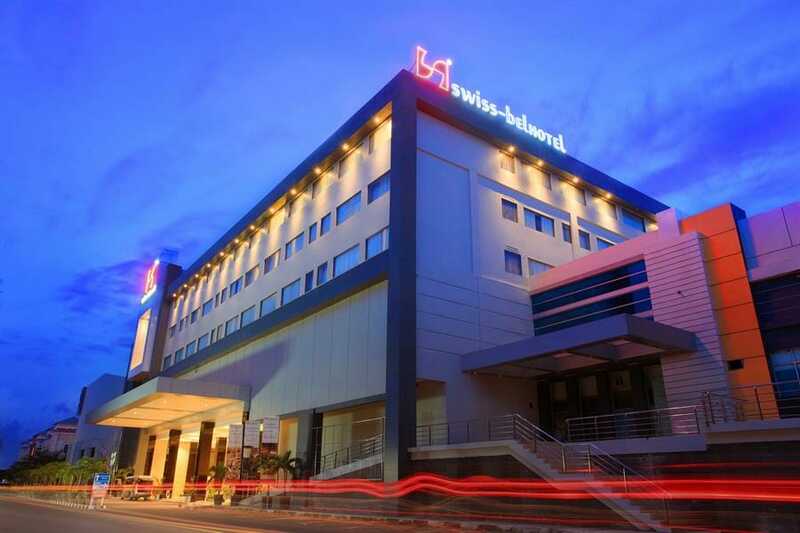 About: Harris Batam Centre is located just opposite of Mega Mall and directly next to to Batam Centre Ferry Terminal. At the moment, there are 171 Harris rooms and in each room, they have their own signature aroma. Pros: There is complimentary Wi-Fi connection throughout the property. Besides its convenient location, this hotel has all the basic in-room amenities: cable television, safe-deposit box, complimentary bottled of drinking water, tea & coffee facilities & hair dryer. Their meeting facilities are one of the best Batam has to offer. Smiley Room 2 can fit up to 50 people whereas their unique ballroom can fit up to 700 people; reception style for both. Cons: Price is slightly higher compared to many other Batam city hotels. Some of the rooms may not be well-maintained as they are undergoing a minor revamp on some of the floors. 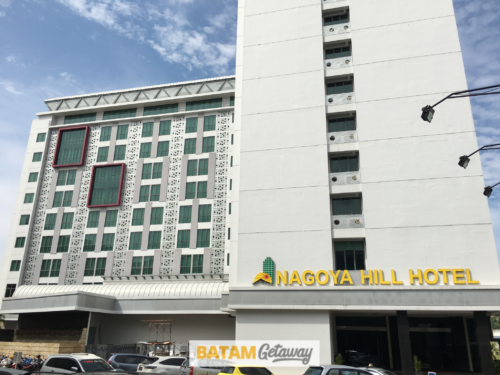 About: Nagoya Hill Hotel is one of the newer hotels in Nagoya which is the central part of Batam. It has 233 rooms. All room types, ranging from Superior Rooms to Executive Suite are tastefully done based on current trends. This is not only one of the most convenient Batam city centre hotels near shopping malls, but also one of the best on the island! Pros: All room types on offer are equipped with a cable Smart Television, in-house movie titles & high-speed wireless internet connectivity. In addition, each room is also equipped with coffee and tea-making facilities & mini-bar! If having a bath-tub is a must, deluxe rooms and above (Junior Suite & Executive Suite Room) have them. They also have a rich selection for breakfast; there is even a Halal food section! Cons: Some of the flooring in the corridor are not well-maintained as there are some scratches and marks. 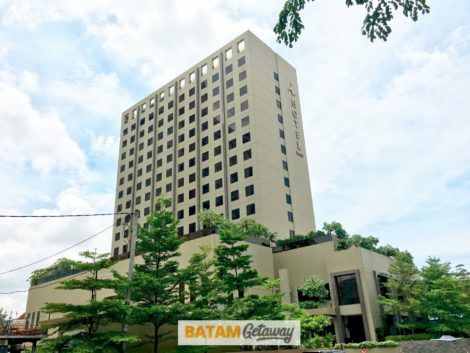 Due to its ideal location in central Nagoya, the price for the hotel may be higher as compared to other Batam city hotels. About: Ranked #1 hotel on TripAdvisor for hotel stay at Nagoya & Penuin area, I-Hotel Baloi is the go-to city hotel. They are offering several room types; Superior / Superior + Balcony Rooms, Deluxe / Deluxe + Balcony Rooms & I-Suite Room. 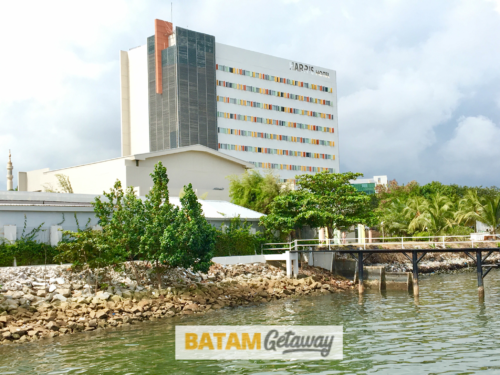 Undisputed one of the most convenient batam city centre hotels near shopping malls and the top in Baloi! Pros: For those who prefer lounging in the hotel room all day, I-Hotel Baloi provides 43 Cable TV Channels. In every room, there is also an one seater sofa and coffee tea making facility. In room safe deposit box and also minibar is also available in every room. For families with younger children, there is also a kid’s pool available on-site. Hotel breakfast is one of the best around Batam. Square Club & KTV is ideal for clubbers and party-goers who prefer dancing the night away! Cons: Vegetarian meal options at the hotel were limited. Most of the times, their non-smoking rooms tend to sell out fast, thus, as much as possible, do request early (during booking), otherwise they will have to put you at the floor of smoking rooms which may not be ideal for non-smokers & families with younger children. Pros: One of their selling points is the choice of food you can purchase here. Hotel has several eateries on-site; Swiss-Café restaurant that serves well-renowned Indonesian, Asian and even International food! Next, there is the Red Lotus which serves authentic Oriental meals. There is also the Swiss Deli that offers fresh-made pastries and bakery treats! Cons: The Harbour Bay shopping mall can be a little inactive if you are travelling during weekdays and non-peak periods.